Chocolates are very special for Valentines Day. So i had planned to make a Chocolate cake for this Valentines Day. Chocolate cake is always preferred for parties, get together and also festivals. This cake is loved by kids and adults without any age difference. Here i am going to present you a fool proof chocolate cake.This cake is spongy slightly moist and also tasty, frosted with chocolate butter cream frosting. Grease and flour or line the baking pan with wax or parchment paper. Sift and stir together sugar, flour, cocoa, baking powder, baking soda and salt in a bowl. In another deep bowl, add eggs, milk, vanilla and oil; beat well using whisk or electric beater. Pour the batter equally into the prepared cake tins. Bake for 30 -35 minutes until the wooden pick inserted in the center comes out clean. Cool the cake for 10 minutes. Unmould the cake and cool completely. Cream the butter by beating using whisk or electric beater. Add the powdered sugar, cocoa and cream alternatively to a spreading consistency. Stir in vanilla. 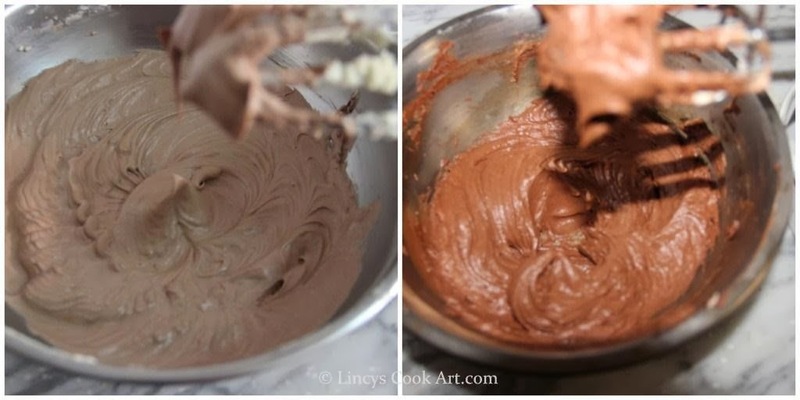 Divide the frosting into two equal lots for spreading and decorating the cake. 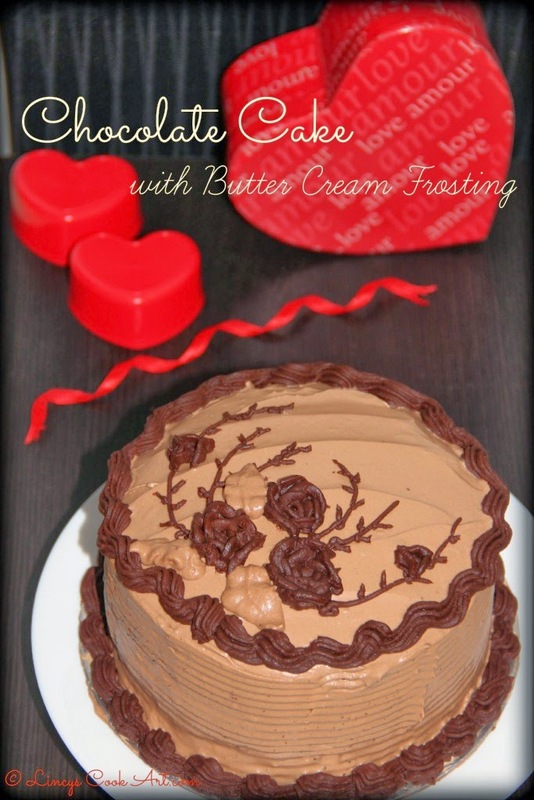 For light brown colour frosting add 2 tablespoons of cocoa and beat well. For dark brown colour frosting add quarter cup of cocoa powder and beat well. Cover both butter cream frosting bowls with cling film and refrigerate until use. Take a hard board and draw 20 cm diameter line and cut the board and cover with aluminium foil and cut the foil to approximately 22cm diameter. Fold the excess 2cm on the opposite side and stick with a tape. Using a pastry brush remove the crumbs s sticking to the cake. Keep a teaspoon of icing on the board and keep the first cake. Apply 2 -3 tablespoon full icing and spread evenly over the cake leaving 1cm border. Keep the second cake slightly press with hand to stick the cakes together. Apply icing on ton top of second cake. Crumb coat (applying a thin layer of icing to seals the crumbs) the cake using a palate knife or icing spatula and allow to set the icing on fridge for 15 minutes. Then spread a thick layer of icing over the cake. Insert the nozzle and fill the icing on the piping bag. Hold the piping bag 900 angle and keep the icing on the cake on your desired design. I have used here leaf nozzle (light brown), petal nozzle (dark brown) and star nozzle (dark brown) to decorate this cake. Note: In Frosting, you can replace the cream with condensed milk or milk in this recipe. If you are using milk reduce the quantity of milk to get the desired consistency. Wow.. such a beautiful cake....getting ready for the V day.....lovely.. and perfect... As cream is amul fresh cream enough?? Yes enough Preetha. Even milk is enough. Add a teaspoon at a time till you get the desired consistency. Lovely cake! Love it to the core. Wish I could take out one piece. beautiful cake..can't take off my eyes from that lovely cake...yummy..
Yummy and beautiful cake lincy. Love it. Such a lovely delicious cake!! look at that baking art, amazing. Beautiful cake..Perfectly made too ,loved it dear. very beautiful cake, love it!!! Beautifully decorated and just one time for Valentine's day. Lovely cakes with wonderful decoration, beautiful art work. Stunningly made and presented Lincy. I couldnt able to remove my eyes from cake.. looks wonderful..
wow so beautifully decorated and perfect made chocolate cake :) excellent job dear :) so perfectly made !! I have just posted step by step tutorial on how to bake a cake. Do visit and share your experience. hi.. is there any substitute for eggs!! Add 1/2 to 3/4 cup of Yogurt instead of eggs. Even you can add some orange juice for more softer cakes. Looks so yummy..... Is icing sugar different from normal Sugar?? Can Normal Sugar be used for Frsoting?? Icing sugar contains little corn starch in it. You can powder normal sugar finely in a blender and use it in case of butter cream icing(this frosting recipe). You can use little cornstarch if you are using whipped cream frosting to get stiff peaks.